Nowadays you can’t drive around the neighborhood without seeing some sort of vehicle graphics. If you are a business owner, even a graphic with your company logo and contact information is a great investment and a very effective way of advertising. Especially in the Los Angeles area where you tend to be in traffic a lot, a vehicle wrap gains a lot of impressions. 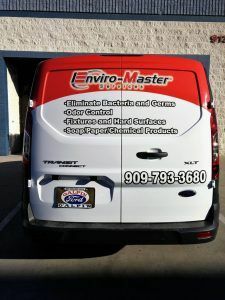 Enviro-Master is a restroom hygiene service that knows that if you are a business that owns vehicles that goes to the customer, you are definitely losing business if you’re not taking advantage of that advertising space. They have 4 locations in the Los Angeles area and over 50 locations nationwide. 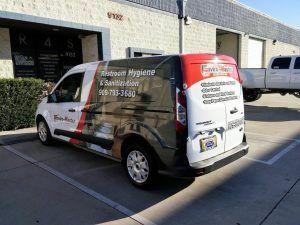 We’ve done many vehicle wraps for them over the years and they came to us recently to do a partial wrap for a new transit connect they purchased for their San Bernadino location. We do the same partial wrap design for all of their vehicles. This is a great way to create brand recognition. Like the FedEx truck, when you start to see the same vehicle graphic or wrap driving around every day, you start to gain customer trust because it is something that they are familiar and comfortable with. It also shows that you are in the neighborhood and easy to get in contact with. This brings us to what you want to display on your vehicle. 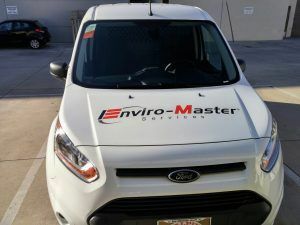 As we mentioned before, we do partial wraps for Enviro-Master. This means that the entirety of the vehicle isn’t wrapped like a full wrap, but there are more than just a few graphics on the door and rear. On the side we have a photo that represents the business specialty without overwhelming the eyes. When it comes to vehicle advertising, it is important that the consumer is able to see the information displayed in a short period of time as the vehicle is usually in motion. We also added a slight border to the wrap with red to help it stand out. Red is used in a lot of advertising because it catches the eye. The contact phone number is displayed on the back and sides of the vehicle, and most importantly, the logo is on the hood, back, and both sides of the car to make sure the customer remembers the name of the company. After your logo and contact information, you want to make sure that you briefly describe the business services. This is what will help a customer decide if what you offer is something that they’re interested in. Just remember not to put too much information, as most people do not want to sit there and read a paragraph as they are passing by your car. Check out our website gallery to get some ideas for your company vehicle. If you’re ready to use your vehicle for additional advertising, you can request a quote here.